But I soon realized that we indeed did have tons in common. 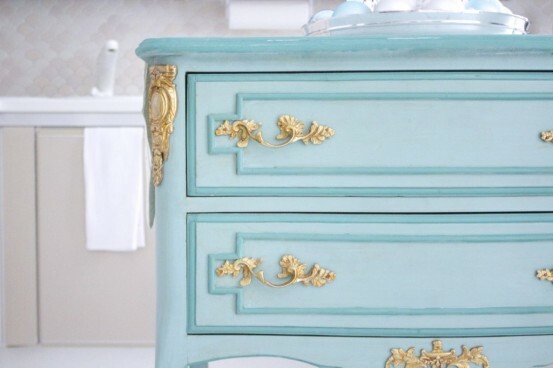 Ashley designs her home from items she finds at European Flea Markets. She maximizes every inch of her small rental row house with creative details that she does herself. Ashley proves my firm belief that you don't have to have a large home or even own your home to make it special. I asked Ashley to describe her design philosophy, and she said, "We currently live in a very small row home with white walls and tiny rooms, so I imagined that we were living in a glamorous Parisian apartment and decorated it with small, ornate pieces of furniture, lots of antique mirrors hanging from the walls, and crystal chandeliers dripping from every ceiling. 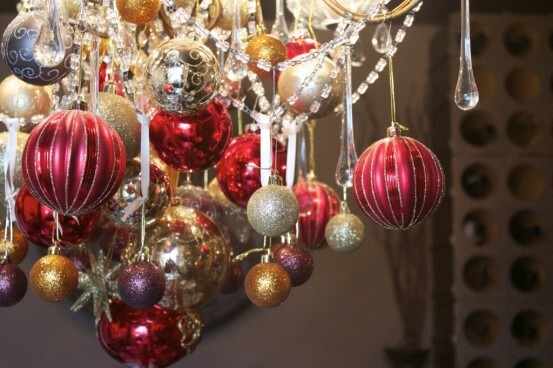 My biggest tip when decorating, is to let your home or area of the world in which you live speak to you!" Ashley is a southern gal who moved to Germany with her husband for his military career, and has created one of the most beautiful homes I've ever laid eyes on. What I love most about Ashley's blog is that she puts her own creative spin on every little detail, and achieves a super stylish look on a reasonable budget. Mostly, though, I just love that her style is so unique. I chose six of my favorite posts from Design Eur Life. I just know you're gonna love 'em. Ashley says this is her favorite room in the house, and I don't blame her. I would basically put a cot and a mini fridge in there and never leave. Ever. I don't care about the logistics. I adore every single amazing detail of this space. The shoe shelves, the scarves hung on the island, and ohhh that chandelier. When I asked Ashley what she looks for at flea markets she said, "Whenever visiting flea markets, I am always on the look out for china/pottery and chandeliers. These are two things I think any vintage lover can never have too much of. 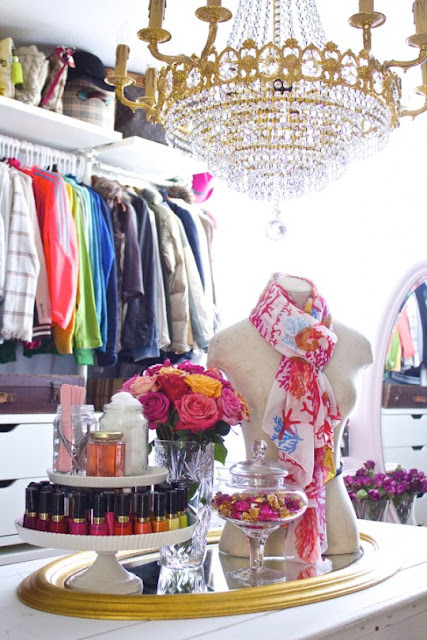 I have a chandelier hanging in every single room of my home, even in closets and bathrooms. I think that hanging a chandelier adds a touch of glamour and elegance to any space!" Well, ya'll know how I feel about chandeliers, and I couldn't agree more. They totally transform a space. The chandy in Ashley's closet does something magical to me. My fave part is the manicure station. 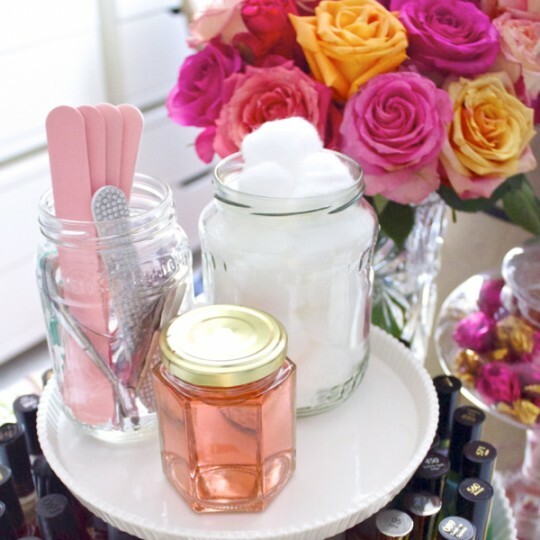 I love the idea of putting your nail polish on a cake stand. And check out how she used that oval mirror as a tray. Genius! I mourn the fact that my dream closet lives an ocean away. You have to go see the rest of the details from this room. It's amazing. See the closet here and the vanity here. #2. The kitchen with the blue island. Let me introduce you to my favorite kitchen island ever...Ashley's blue & gold flea market find. That one piece completely makes this kitchen. There are tons of other delicious details, too. 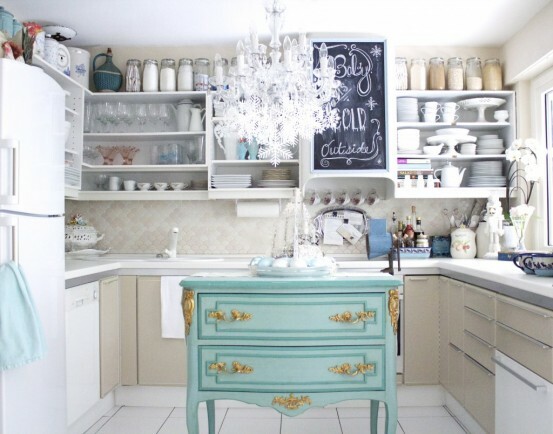 For example, the crystal chandelier, chalkboard message, and organized open shelving. I love that Ashley's not afraid to mix metallics, like combining her sleek silver cabinetry pulls with the ornate gold hardware on her island. So stylish! 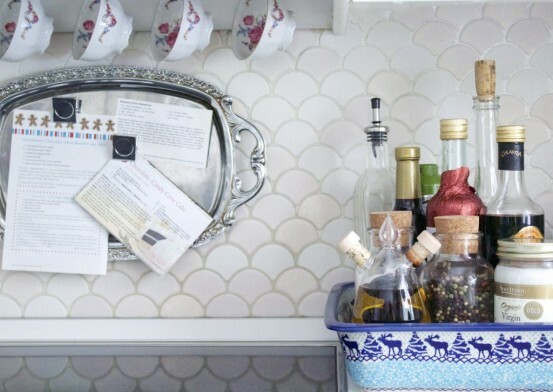 And I love the idea of using a silver tray as a magnetic memo board. Check out that great backsplash, too. To see the full tour of Ashley's kitchen visit here. I really think design is all about the details, and that is truly what this home demonstrates. It's just gorgeous. Welcome to the dining room. Let me remind you one more time, Ashley did this all herself. She says china is one of her favorite items to hunt for at flea markets and calls herself a bit of a 'china hoarder'. Well girl, it's workin' for ya. I will issue you a hoarder's hall pass. 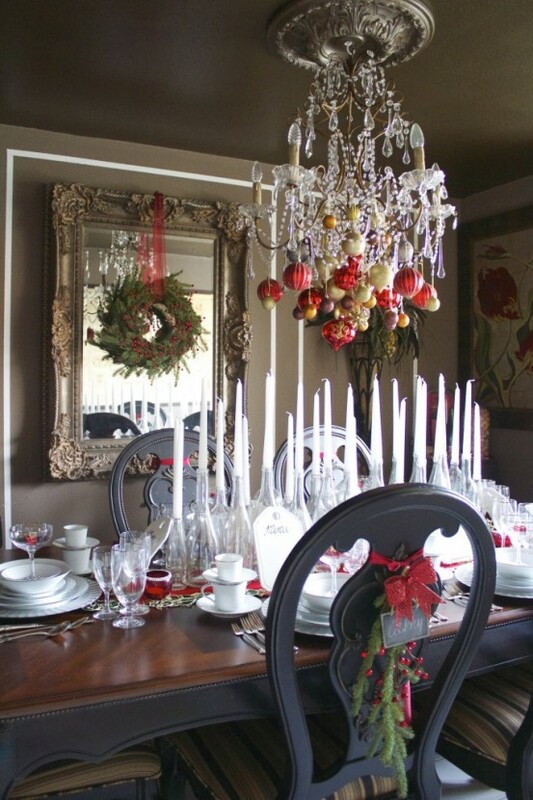 I am so inspired by the way she uses ornaments to decorate her chandelier during the holidays. Can I just do that year round? I won't tell if you won't tell. You can see all the pretty details of this dining room here. 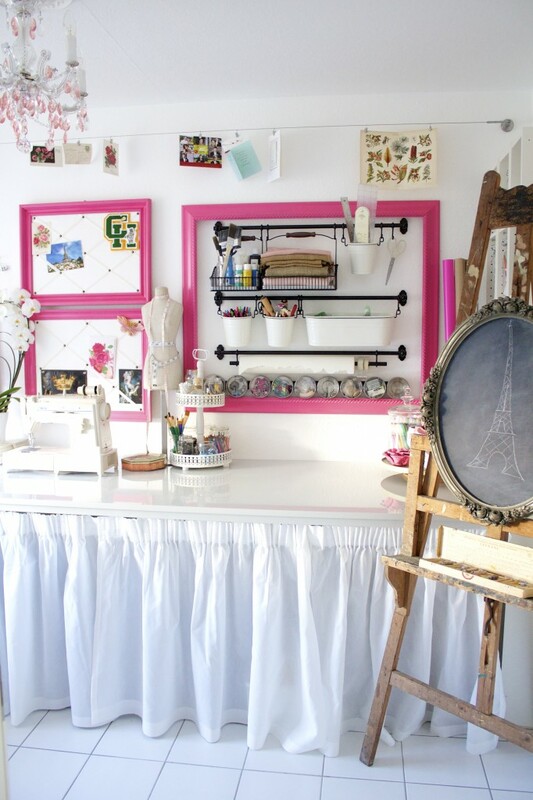 I'm a sucker for a great craft room, and this one is so lovely! I love each little detail like the pink frames, pink chandelier crystals, and the Eiffel tower drawn on the chalkboard (on an easel!). Ashley should win an award for world's best organizer. 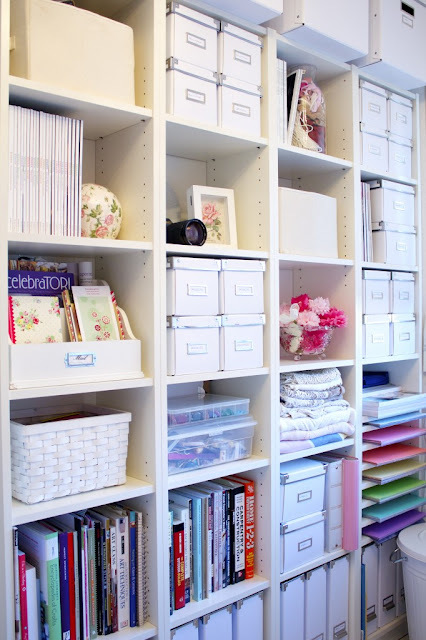 Basically, if you organize your craft paper, you win. 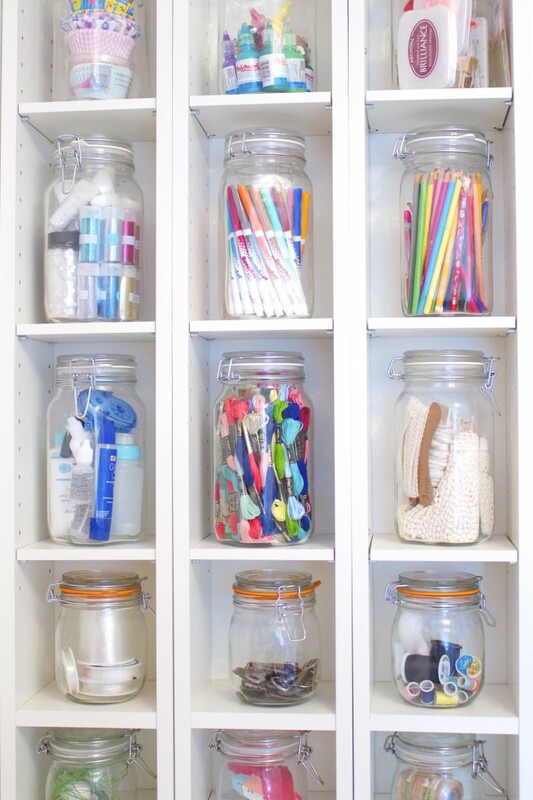 Or if you have a jar for each craft supply on its own little shelf....you win. Is anyone else's head bursting with inspiration? The best part is that I've only shown you a teeny fraction of the details of this room. You'll have to visit the craft room to see the rest! Decorating for the holidays is one of my favorite things to do. I always love when someone finds a unique approach to holiday decor, rather than the traditional green and red. 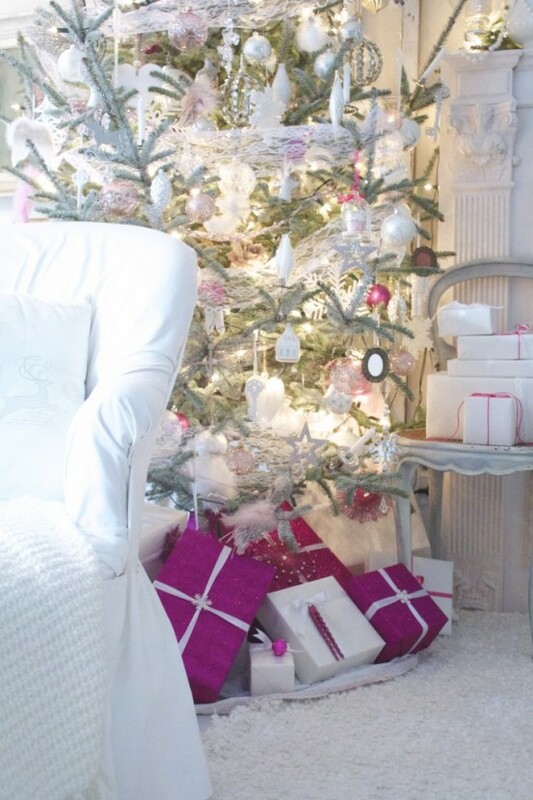 I love Ashley's pink and white...so cute! You can see the rest of her amazing holiday decor here. I absolutely adore this post. 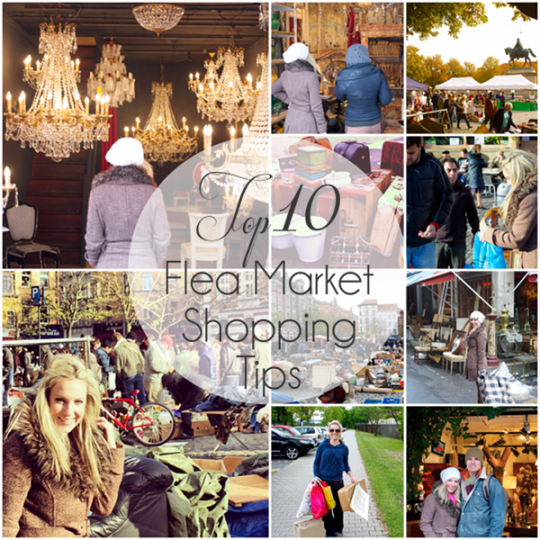 Ashley shares her best flea market shopping tips, and takes us along on a trip to the European flea market. It's so fun to see things through her eyes. You can see her flea market tips here. Thank you so much for stopping by today! I hope you'll take a minute to stop by Ashley's beautiful blog and say hi. That's this week's Wednesday 6! 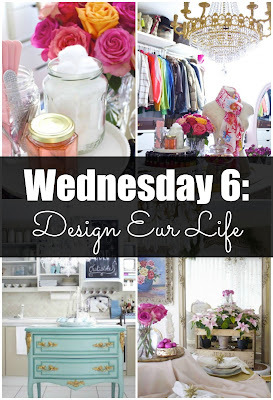 To check out last week's Wednesday 6 (ohhh, you'll love it!) click here.